Before we get started, be sure to enter your email above for the email care course! And don’t worry, a Horsefield tortoise is the exact same as a Russian! Tortoises make great pets, however many of them are now classed as an endangered species. But there is still one that is readily available in the United States of American that does not fall into that category, the Russian Tortoise. Also known as the Horsfield Tortoise or the Central Asian Tortoise it was named after the American naturalist Thomas Horsfield. Before you go out and buy one of these small tortoises which range from 13-20cm for the male and 15-25cm for the female it is important prospective owners understand their water and feeding requirements. Giving them the wrong food can make them ill and giving them their daily water in the incorrectly shaped water bowl can kill them. They are greedy eaters and if they are left to their own devices they will destroy every plant in your garden so they must have their own outdoor enclosure planted with tortoise-safe seeds. Listed below are some of the things you can plant in their enclosure. The best diet they can have is natural foods and you can get weeds, shrubs and plants that they can safely eat in the summer months. Dandelions are an excellent plant to feed off and when planted spread profusely. When the summer is over you will need to provide a variety of different edible plants and leaves every morning to satisfy their eating habits. 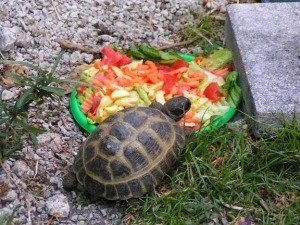 These should be varied and your tortoise should not be fed the same things every day. There is so much to choose from it is easy to build up a variety, hibiscus flowers and leaves, mulberry leaves, mallow flowers and leaves and chrysanthemum flowers are all good choices, as are cornflowers, forsythia and dayflower flowers and leaves.
. Tortoise-safe organic weeds, plants and herbs especially dandelions. If you buy the greens in a shopping mall you must make sure they are thoroughly washed to remove any chemicals which can cause vitamin deficiencies in your pet. Vegetables should be fed in moderation but about once a month you can feed your tortoise a small piece of carrot or a small piece of pumpkin. You can also occasionally let them have cabbage leaves but not too many and not too often. In the winter you need to provide extra vitamins by sprinkling dried ground tortoise-safe weeds on their food which you can get at any pet store. Grass, clover and dandelion are the best. They also need calcium all year round which they can get from a cuttlefish bone or limestone. If they will not touch these then you must sprinkle calcium on to their food.
. Tortoise-safe organic green plants and weeds. Water is essential to any pet but especially to the Russian Tortoise who should have a bowl of water left down at all times. The bowl is just as important as the water inside it as a steep high-sided bowl could result in the death of your pet. If it tips over the side and lands upside down it could drown so a shallow low-sided bowl is what you need. Watching your tortoise eat is an amusing sight as in the wild tortoises can eat more than two hundred plants a year. Most tortoises in captivity are active all year round but those who hibernate are geared up to eat for only a few months of the year. Then when they come out of hibernation they eat and eat. As a change from leaves you can chop up hay and mix it with greens and it is a good idea to have fresh hay in their pen. You can occasionally feed them the leaves of the romaine or red and green lettuce and endive, escarole, radicchio and chicory are all good for them. Some people make a mistake in giving egg shells to their tortoise as a source of calcium. These are very bad for your pet and will cause salmonella. The best source of calcium to spread on its food is plain calcium carbonate which can be bought in any store than sells animal feeds. Never be tempted to give your tortoise a treat by sharing what you are eating. Pizza, burger, ice-cream, bread and milk are all very bad and can cause irreparable harm. Keep a watch on your tortoise’s weight. If it ism beginning to look fat you are giving it the wrong diet. A tortoise that is permanently overweigh will end up suffering from fatty infiltration of the liver which could be fatal. Having a Russian Tortoise is not just a question of putting it in a pen to fend for itself. You need to keep an eye on the diet, drinking bowl and appearance of your pet. Make sure it has daily calcium and the additional vitamins in the winter. But they are hugely rewarding and not too costly to keep. A healthy tortoise can live for many decades so you can almost grow up with your tortoise. The most important thing is to ensure they have daily water in the correct shaped bowl and you are feeding it the correct diet. To get the best information (that I don’t post on this public site!) 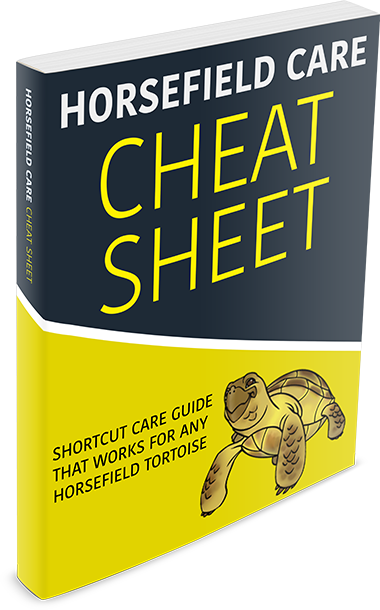 be sure to enter your email below to get your free instant care guide!